Based off the 1987 musical of the same name, INTO THE WOODS brings several fairy tales – Including Rapunzel, Cinderella, Little Red Riding Hood and Jack and the Beanstalk – to life in an ambitious musical. Not every fairy tale has a happy ending... and in the case of Into the Woods, that is pretty much what the message of the film is. Into the Woods is a very interesting musical, which manages to mix the tales of well known fairy tales in a fun and unpredictable way. 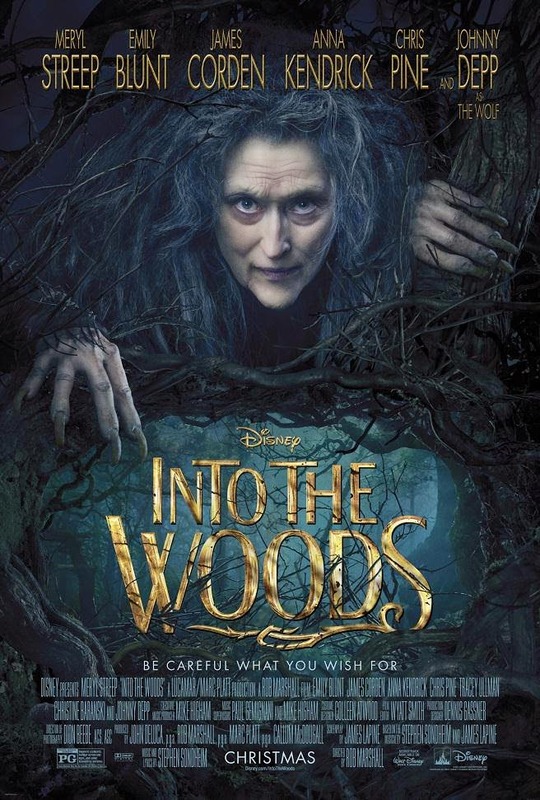 The way that the intertwining stories play out in the film is not what we’ve become familiar with when it comes to fairy tales, and that fact is what makes Into the Woods exciting. It delivers a refreshing take on the fairy tale trope by turning the stories on its head. I can’t speak to the authenticity of the adaption from the Stephen Sondheim and James Lapine stage musical but as a first timer watching the story, the film does deliver an engaging story. Director Rob Marshall, of Chicago fame, does a great job at directing the movie. He puts his expertise at handling musicals to great use as he never lets the story get bogged down by the musical sequences. The movie does however have issues with the tone, as the director struggles to strike a balance between the comedic and dramatic moments. I noticed that a few humorous bits landed awkwardly and could have been executed better. The director does succeed at some points but then loses it again. One of the moments that the film achieves this balance perfectly is in the musical sequence Agony sung by Chris Pine and Billy Magnussen. The two men really excel and deliver a super vocal performance in the song with each playing their roles to perfection throughout the musical sequence. Chris Pine really delivers in the role of Prince Charming, and you can’t help but fall for his character’s charm. He thrived at playing the cheesiness and melodramatic nature of the role, and the performance in the song is proof of that. Billy Magnussen doesn’t allow Pine to steal all the glory, also getting his chance to shine in the sequence. The rest of the cast was absolutely lovely. Emily Blunt, who I had no clue possessed such a lovely voice, was stunning in the role of Baker’s Wife. I fell in love with James Corden as the Baker who shoulders most of the movie. He carried the role in such an endearing way that it is difficult not to empathise with the journey of these two characters. It’s not needed to say but Meryl Streep is Queen, no matter the role, and in her role as The Witch she doesn’t disappoint. She shows off the different layers to her character never really settling in one stereotype or another Anna Kendrick who has immense Broadway credentials really shows off her vocal talents in the role of Cinderella. John Depp’s role is short lived in the movie but he really does an impressive job too. The two young actors playing Red Riding Hood and Jack (from Jack and the Beanstalk) manage to impressively hold their own against the older cast members. If anything is clear from the movie, it is that Marshall really demands that the actors put their all into the role. Into the Woods is not your typical musical where songs play out like a track heard on the radio. Sometimes the musical sequences are interrupted by dialogue and the actors really get to perform the songs, not just sing them. Marshall gives the actors the ability to pick their moments. Anna Kendrick revealed that there was a mixture of live-sung and studio recorded performances used in the movie. You can really tell that it makes a difference as the movie allows the musical sequences to some plot points forward. Songs are not just sung to interrupt the flow of the movie, but instead to progress the plot along. Overall Into the Woods is quite the enjoyable film and if you love your movie musicals then this one is a definite must see.